After Cape Ann on the north shore above Boston, the Atlantic coast is essentially one long beach broken by harbors at the mouths of rivers big and small. There are a few rocky points until you reach Cape Elizabeth in Maine, but it is at Cape Elizabeth that the geology of the coast completely changes to the rocky island-filled bays that characterize the Maine coast all the way to Canada. Casco Bay, then, is the first of Maine’s major bays. By reputation it is filled with the Calendar Islands, meaning one for each day of the year. Indeed, there are dozens of major islands, at least 200 smaller ones and numerous deep bays to explore. 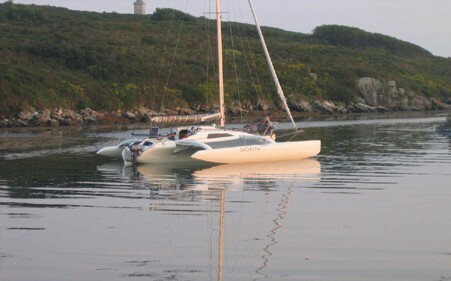 Portland is located on the back side of Cape Elizabeth and is a great base for sailing in Southern Maine. It is a major commercial port and a yacht friendly harbor, and is Maine’s largest city. It has easy access to highway, bus and rail networks and a wealth of restaurants, hotels and sights. For cruisers, there are a number of marinas directly adjacent to the Old Port area of the city. Dimillo’s Marina is right in the heart of the Old Port, but their docks are not particularly multi-hull friendly. Portland Yacht Service (PYS) is just a fiveminute walk to the Old Port area and offers both dock space and moorings. Call them at 207-774-1067 or VHF channel 9. When you enter Portland Harbor and approach Ft. Gorges on your starboard side, PYS will be directly in front of you on the north shore, just to starboard of the large marine terminal. Be aware that the steady marine traffic and urban lighting can make this a less than calm spot. One option is to tie up at the marina and enjoy the facilities, have a great meal at one of Portland’s gourmet restaurants, and then motor across to Cushing’s Island, where there is a nice quiet mooring area where you can anchor. In fact, the whole passage between Peaks Island and the Diamond Islands has plenty of places to anchor among moored boats and spend a quiet night. Anchoring on the edge or in a large gap in a mooring field can be done judiciously anywhere in Casco Bay, based on my experience. Stay out of obvious channels or harbor passages (usually marked by small channel buoys) and you should be fine. You could also motor around what is marked as Fish Point and Pomroy Rock to East End Beach, a large mooring field with places where you can anchor. Heading further up the channel towards Back Cove will bring you to the Maine Yacht Center, where participants in the Downeast 180 tie up and rest after the race. If the weather is calm you can tie up on the outside face of their docks, and they are planning an expansion that will offer more room. Contact them for space availability (207-842-9000 or channel 9). From here it is a short taxi ride into town or a 20-minute walk. If you are trailer-sailing, East End Beach has a public ramp with limited parking for a fee. PYS and MYC both have ramps they can make available, and parking by prior arrangement. Both will charge a fee. Much of the season I’m based in Portland, generally at MYC, and love this area for daysailing and short cruises. Often when it is foggy outside, the inner bay will be clear, and the water is quite flat among the islands. I can sail up the inner bay on a beam reach all the way to South Freeport and return which makes for an effortless trip. South Freeport and the Harraseeket River is another fine anchorage. Contact South Freeport Marine (207-865-3181 or channel 9) for mooring availability if you don’t wish to anchor. Also on this route is Falmouth Foreside, home to the Portland Yacht Club and Handy Boat Service, both of which provide moorings and launch service. Immediately after leaving Portland Harbor the commercial feel slips away and you will be among quiet homes or natural shoreline. There are endless variations to sail among the islands. Jewell Island, on the outer band, has a wonderful harbor, but it fills quickly on weekends. The island itself is a park and has lovely paths to the large World War II watchtowers that you can climb and explore. Eagle Island, further up the bay at the mouth of Broad Sound, is where Admiral Perry made his home after his polar explorations. There is a nice small museum on the island devoted to him. You can anchor and row to the dock. The Goslings anchorage off Lower Goose Island is particularly beautiful. And, Luckse Sound is one of my favorite sails. You can pick your way among the mostly empty islands, and never sail the same route twice. Taft’s Cruising Guide To Maine has a wealth of information about this area. I also use the Active Captain website (activecaptain.com), but of course this is only available if you can get online. This is just a taste of the western portion of Casco Bay. All the way to Cape Small, which is the eastern end of the bay, are numerous other deep sounds cut by the glaciers that formed this area. You can sail up each one, be it Middle Bay, Harpswell Sound, Quohog Bay or the New Meadows River and find more small harbors and pleasures. Often people think you have to travel to Penobscot Bay to enjoy real Maine cruising, but the delights of my state are available right near Portland. Jesse Deupree sails Sorn, his Corsair 31, out of Portland, ME and serves as the New England Multihull Association’s (NEMA) Gulf of Maine Fleet Captain. This article was originally published in the spring 2013 edition of the NEMA newsletter and is reprinted with permission. Special thanks to editor Andy Houlding. NEMA is a non-profit organization dedicated to the promotion of the art, science and enjoyment of multihull yachts. For more information including the NEMA racing schedule, visit nemasail.org.